The HORI D-Pad Controller, does it hold up as a Joy-Con alternative? Is a D-pad worth sacrificing HD Rumble and wireless connectivity for? When Nintendo unveiled the Switch’s Joy-Con controllers, many were quick to notice the distinct lack of a directional pad. After all, Nintendo had been including D-pads on their controllers since the NES, so its omission was striking. It’s clear now that the D-pad’s banishment from the Joy-Con was a necessary evil. Being able to tear off the Switch’s controllers for two-player gaming anywhere requires matching controllers. It’s a trade-off that works for many games but I’ve always felt that 2D games are better suited to a D-pad rather than an analogue stick. Of course, when playing in docked mode you can make use of the Pro Controller’s (admittedly bad) d-pad but what about handheld? HORI aims to solve that problem with their D-Pad Controller. Licensed by Nintendo, the controller promises to be a replacement left Joy-Con for players who prefer to play with a directional pad. I’ve been using The Legend of Zelda: Breath of the Wild themed controller but there’s also a Super Mario Odyssey edition available. Both variants feature translucent plastic with decals to match the franchise they belong to. I had concerns that the plastic would feel different or cheap but it’s still got that same lovely matte feel to it. Pokémon fans are also in luck as HORI are planning to release a Pikachu themed controller alongside Pokémon: Let’s Go! on November 16th, 2018. 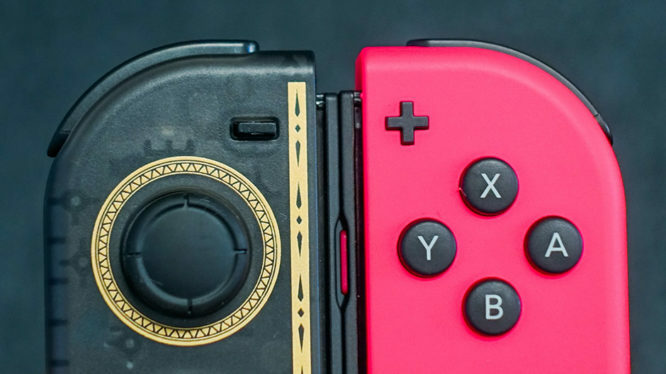 At first glance, the controller looks to be almost identical to a Joy-Con but with a pad in place of the four directional buttons. However, if you dig a little deeper there are a few more differences to be aware of. Most importantly, the Hori D-Pad Controller does not work wirelessly. It doesn’t even have a battery inside, making the controller feel much lighter. As it’s designed for handheld only, the usual SL and SR buttons along with the sync button and lights have been left out too. 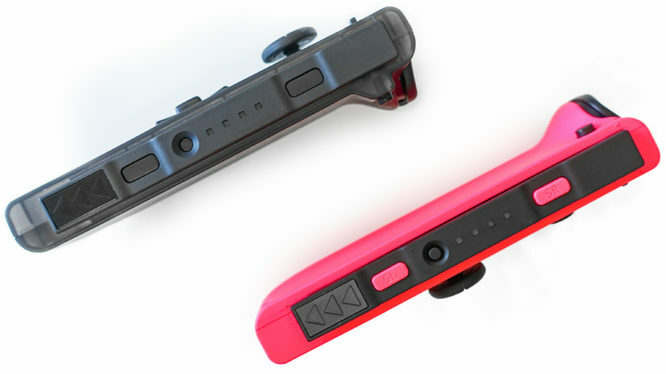 The side of the HORI D-Pad Controller compared with a Joy-Con. Note the lack of SL, SR and sync buttons. Also missing is rumble (HD or otherwise). I’ve become accustomed to rumble since the original PlayStation so thought this would be somewhat of a dealbreaker for me. What I didn’t anticipate was that the right Joy-Con’s HD Rumble would be enough. When playing games like Fortnite the rumble actually resonates through the entire console and can be felt through the left controller anyway. This likely depends on the strength of the feedback being given by the game, but I was pleasantly surprised. HORI also state that the D-Pad Controller doesn’t include motion control sensors. However, in my testing, I’ve not found this to be an issue at all. When playing both Splatoon 2 and Fortnite I was able to use the gyro aiming exactly as I could with Nintendo’s Joy-Cons, likely making use of the Switch’s built-in sensors. I think it’s worth noting that the exclusion of wireless connectivity and HD Rumble is reflected in the price. The HORI D-Pad Controller is currently on sale for around £25 / €25 / $25, which when compared to a left Joy-Con at £39.99 / €39,99 / $49.99 feels like a fair deal. The lack of rumble is irrelevant if HORI’s Joy-Con clone doesn’t deliver the goods when it comes to the D-pad. Honestly, it’s the only reason to consider buying the controller so it’s a good thing it doesn’t disappoint. Unlike the Switch’s Pro Controller, HORI’s D-pad has a great pivot to it and doesn’t feel hard to press at all. There’s no audible “click” like there is on a Joy-Con and it’s a breeze to slide from all directions. I don’t exactly know what to compare its feel with. It doesn’t really feel like an NES or N64 controller D-pad. I’d perhaps say it closest resembles something found on a Wii Remote with a slightly longer travel. In any case, it’s a marked improvement over the stock option. Visually, everything else is practically identical to Nintendo’s official Joy-Cons. The L shoulder button does sit a little higher but it’s no more difficult to press. It is a little clickier than other Joy-Cons I’ve tested though. In fact, that seems to be the case with the ZL and stick too. The L shoulder button sits a little higher on the Hori controller. Unfortunately, that clicky feel isn’t extended to the minus or screenshot buttons. HORI opted to make these out of rubber for some reason, so they feel distinctly mushy. This is particularly egregious on the minus button due to its size but also because (at least on my unit) the button sits fairly high. Because of this, there were times when I went to press it and ended up bending the button instead of clicking it. Thankfully this lessened as I spent more time with the controller. The HORI D-Pad Controller is solving a very real problem for me. I far prefer playing games like Undertale, Hollow Knight and NES classics with a D-pad as I feel it’s more precise. Now there’s a way to do so when playing in handheld mode which is delightful. I can live with the lack of rumble, ability to play wirelessly and a couple of buttons feeling mushy in return for a directional pad but I wish I didn’t have to. The Joy-Cons felt like they were trading a D-pad for play-anywhere flexibility and the HORI controller has other trade-offs to weigh up. On the whole, those trade-offs are worth it for me but they might not be for you. I really like the look of the controller I have. The translucent plastic has a 90s vibe to it and the gold decals are a nice touch. Having said that, it would have been nice to see Japan’s solid blue variant made available in Europe and North America as it seems to pair up with other Joy-Cons a little better. 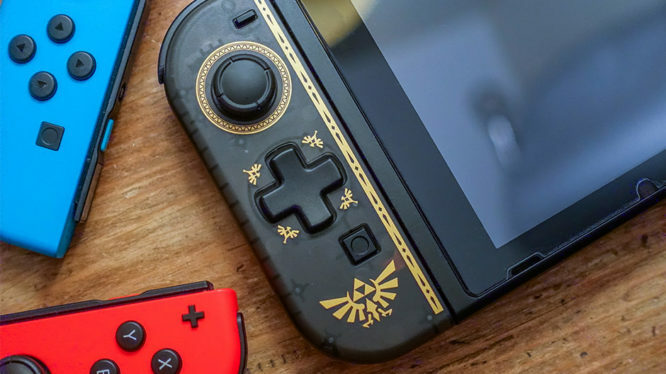 Perhaps HORI could also look to release a matching controller for the right-hand side because I’d love to finish off this Zelda look. There’s always the option of taking a Joy-Con apart and replacing its shells should the Hori’s sacrifices be too much for you. That will obviously void your warranty and is a step too far for me. I’m still hoping that Nintendo will put an NES-style D-pad in Joy-Con complete with wireless and HD Rumble someday. In the meantime, the HORI D-Pad Controller has proven to be a good option and will remain fixed to my Switch for the foreseeable future.